The Inauguration of Brong Ahafo Association of USA, NJ (Newark) took place on Sept 29th 2018. It started at 10.00pm with the arrival of all members of the Newark branch on the inauguration floor. Afterwards, the Chiefs, Queen mothers, and the invited guests were introduced. Among the guests who attended the inauguration were, Nana Odeneho Osei Kwabena, who is a member of the council of elders of Council of Brong Ahafo Associations of North America (COBAANA). Nana Ayisiwaa Agyeiwaa who is the Bechem Traditional Akyeamehemaa, Nana Ama Korantemaa, who is the Annum Omanhemaa. Members from Cobaana chapters ie, New York, New Jersey (Trenton), Delaware, Canada and Ohio (Columbus), Ghanaian Associations in Newark, and invited guests by members. Each of these Associations made a donation to the Newark chapter. The swearing in of the Executives of Newark chapter was conducted by Nana Odeneho Osei Kwabena of Columbus, OH. He advised the executives to work together as a unit for the success of the Association. He stated that the challenge now is how the executives work together because after the inauguration, there are likely going to be internal and external forces that would test the unity of the executives and the Association. Failure to stand together could cause the Association to collapse. The keynote speech was given by Dr, Obiri Addo who is a professor of African studies at Seton Hall University, NJ. He was introduced by Ms Juliet Amponsah, the president of the Newark branch. She stated that Dr, Addo has been a professor for many years. The topic of Dr, Addo’s speech was ” Rise up and possess your history “. In summary, he stated that Bono Manso/Kintampo/Techiman culture formed the basis of most Akan cultures in the present day Ghana. Therefore, the Brong Ahafo people should be proud of the culture and traditions in that they have contributed immensely to the Ghanaian culture. The state of the Association speech was given by Dr, Nsiah Acheampong who is the vice president of the Association. He spoke about the increase in membership in a few months through efforts of members, especially in telling people about the re-established Association and the focus of the new executives and members for the success of the Association. The speech by the Chairman of the inauguration, Dr Kwame Sintim Damoa centered on the Newark Association in helping with the healthcare delivery to improve the lives of our relatives in Ghana. He said that providing some of the expensive medical equipment that are needed but expensive for hospitals and the government to purchase is very crucial in saving lives. This is the reason why the Newark branch is stepping in to provide some of these equipment. 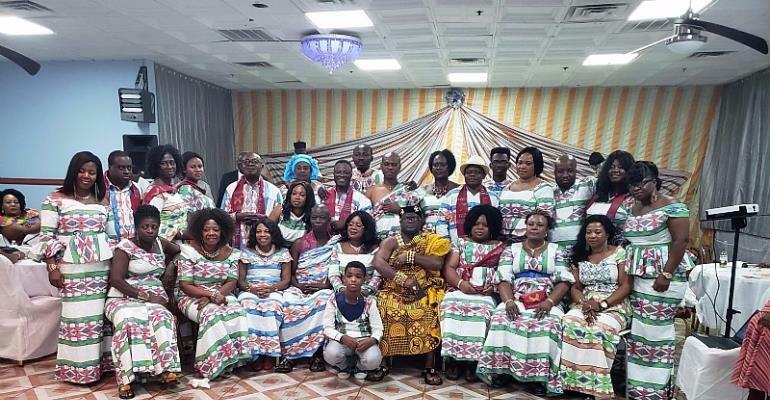 Some of the Ghanaian Associations in Newark, NJ that attended the inauguration are first First Ghanaian Society of NJ, Dollar Ladies, Executive Club, Kwahu Association, Akyem Association, Small Scale Christian Association, Association of Pusiga People,etc. The leaders and members of each Association were given the floor to introduce their Associations and the opportunity to dance to their Associations’ preffered music. Fund raising was the next and it took the form of Kofi/Amma whereby all the Akan names of days born were called out. The competition was won by Kwadwo and Adwoa. In all, funds raised were more than what was expected. The number of people who attended were in excess of 400.